Oooops . . . sorry for missing out a few weeks of updates. Busy time with a few challenges. But without further adieu, let me introduce this week's guest -- storyteller Owen Pilgrim. Owen originally hails from the small fishing village of St Anthony's at the very northern tip of Newfoundland, but now makes his home in Fife, Scotland. 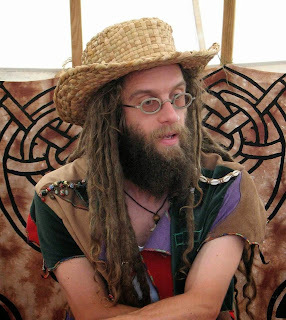 Join me as I catch up with Owen and learn more about his life, why he came to Scotland, and how he's forged a career as a storyteller, woodcarver, and Forest Schools facilitator. The programme gets under way on Sunday 5th July at 12noon BST (UK/Ireland) on Blues and Roots Radio. Click on the preceding link and go to their website at the appropriate time and voilá, you'll be listening. For times in the Eastern time zone in Canada and US, you'll wanting to be tuning in at 7am. And if you live in Australia, tune in at 9pm. If you're elsewhere in the world, check www.bluesandrootsradio.com for times in your area. If you can't make Sunday, the show is repeated on Tuesday and Thursday (or Wednesday and Friday for you Australians). 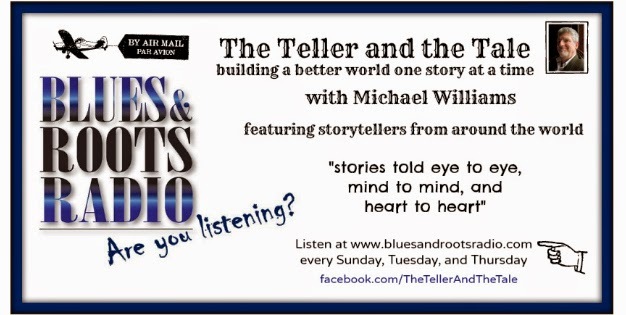 So, don't forget to tune in and listen to storyteller Owen Pilgrim for some good ol' fashioned oral storytelling "told eye to eye, mind to mind, and heart to heart."